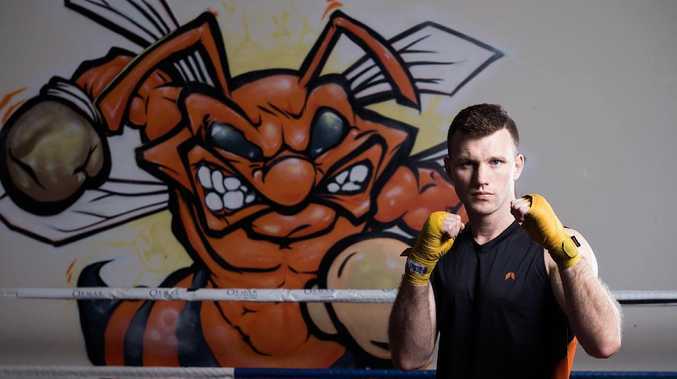 IN The Courier-Mail's first feature article on Jeff Horn, he was surrounded by a gang of nine-year-olds and a little girl was beating him up. The photo of one of his school students hitting him on the chin while her classmates cheered, still makes him laugh ahead of the biggest challenge of his life. 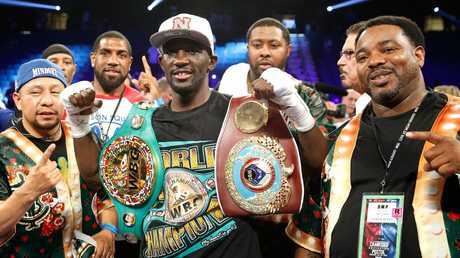 Wednesday Horn flies with his wife and baby daughter to Las Vegas to fight Terence Crawford, a man so tough that he once drove himself to hospital after a gangster shot him in the head. Brisbane's Fighting Schoolteacher is all class, Crawford a product of America's mean streets. They fight on June 10 (Australian time) at the MGM Grand Casino in Las Vegas, a gaudy, green icon to greed which is decorated in the colour of American money. The bitterness between the camps is extreme, with Horn's trainer Glenn Rushton saying he is more than ready to defend himself from a threatened physical attack from Crawford's beefy, foul-mouthed trainer Brian "Bomac'' McIntyre, a former heavyweight boxer. WBO junior welterweight champion Terence Crawford (C) poses with Brian “Bomac’’ McIntyre (R) after his unanimous decision victory over WBC champion Viktor Postol of Ukraine in 2016. 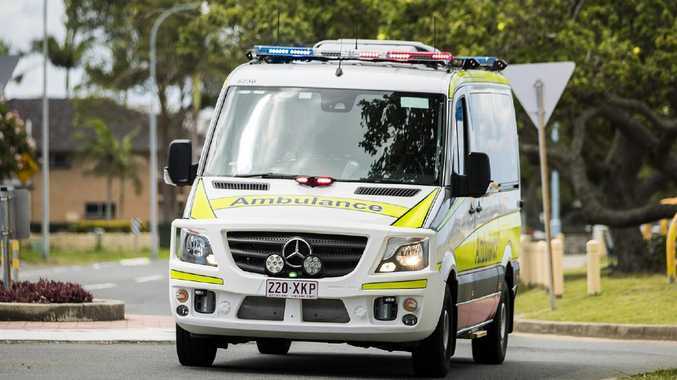 The war of words escalated on the weekend when Bomac launched a foul-mouthed tirade at Rushton and saying he couldn't wait to shut him up. This was a reference to Crawford's withdrawal from his planned April 14 fight with Horn citing a sore hand, a sore point to the Australians who claimed Crawford was stalling for more time to get ready. 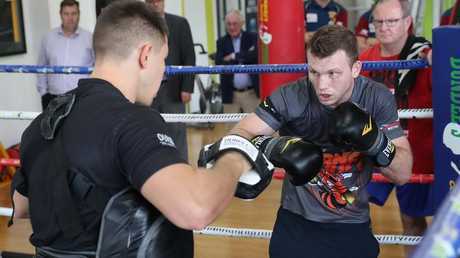 Jeff Horn (left) held a torrid sparring session against American fighter Ray Robinson on May 17, 2018. They are tough words from a tough crew. In September 2008 in his hometown of Omaha, Nebraska, Crawford was sitting in his 1986 Pontiac Cutlass Supreme under a street-light counting his winnings from an illegal dice game. 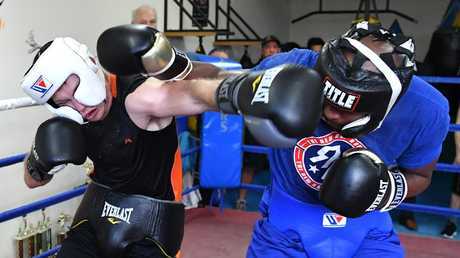 He had just won his fourth professional fight and was getting ready to box on national television for the ESPN network, who will telecast the Horn fight in America. A gunman firing a 9mm pistol shot him through the rear window of his car while taking aim at another player in Crawford's group. With blood cascading down the back of his head, Crawford drove himself to hospital, phoning both his mother and his trainer along the way. The bullet had exited through his neck and after having the wound stitched, Crawford drove himself home. He won his next fight a few weeks later on national television. By knockout. Crawford later learned that the man who shot him was in turn killed by a gunshot wound to the head.